Q: Renée, can you start by giving me a brief description of the various testing modes offered by SHOEBOX? A: Our first, and most basic, is the self-administered “pass/fail” screen offered in SHOEBOX QuickTest. QuickTest is a very fast – under a minute – self-administered simple screening test. It is not threshold-seeking. Rather, it is a tool used by hearing services clinics to identify potential new clients. Simply put, this is a lead generation tool. It engages audiences – whether at health fairs, in waiting rooms, or retail outlets – to take a simple test. The user inputs their contact details. If they pass the screening task, there may be no next step. However, if they show signs of possible hearing loss, the clinic can prioritize a follow-up email or phone call to schedule a clinical appointment. 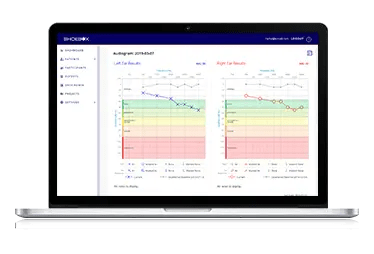 Next is our Automated Test Mode available in both Standard and Pro editions of SHOEBOX Audiometry. This test is generally performed by the patient themselves. They present the tones themselves, then sort them into the requested categories. Its algorithm follows a modified Hughson-Westlake protocol. This is a fully automated threshold-seeking test. The successfully completed output is a clinically valid audiogram. Automated testing mode is also self-administered. It operates almost like playing a game on the iPad. In Automated Mode, the test subject is presented a screen with a blue disc that may or may not play a tone when tapped. If the test subject hears a tone when the disk is tapped, they drag and drop it to the top corner of the screen. If they do not hear a tone when tapped, it is dragged to the bottom corner. The beauty of automated testing? It lets almost anyone – including non-audiologists – administer a clinically-valid hearing test. During an automated test, the administrator can have minimal interaction with the test subject. They can watch what is happening, but remain at arm’s length to the test subject, unless the subject could benefit from additional assistance. With the release of version 5.0, SHOEBOX now provides alerts for various testing considerations. For example, if the test subject is having difficulty with the sorting or response task, a screen will appear to ask for administrator assistance. There are other conditions – such as environmental noise, and the need for masking – that could impact test accuracy. Our patent-pending REACT™ wizard (Response and Environmental Adaptive Control Technology) can detect various issues, and alert the tester to make modifications for test completion. At this point, the administrator may choose to switch the system to Assisted Mode. More about this in a minute! SHOEBOX Pro also offers Manual Testing Mode. 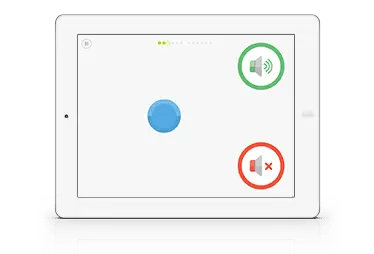 This testing mode gives complete control of all test parameters to the hearing healthcare professional. Manual testing is the method of choice among Audiologists, Hearing Instrument Practitioners, ENT physicians, and CAOHC-certified Occupational Conservationists. Back to Assisted Mode. Assisted Mode is a partially-automated test that is controlled by the administrator. The administrator choses to present a tone, and the test subject provides a visual cue if they hear the tone. In Assisted Mode, the administrator plays a more integral part in the process which gives them the ability to better control the test delivery. 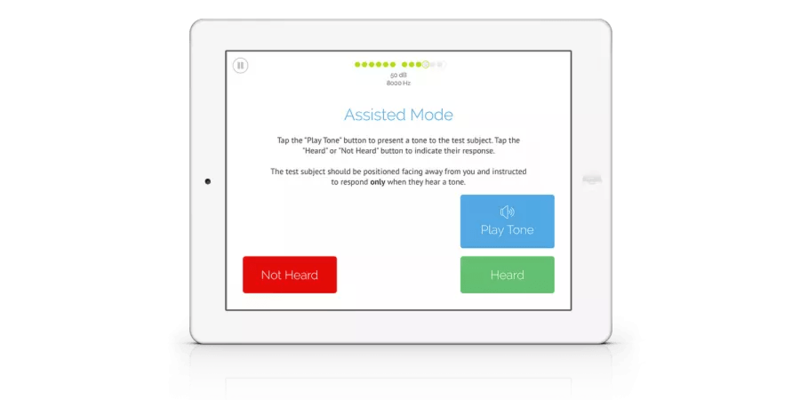 Assisted Mode is ideal when time is a factor and testing must to be done quickly, or when interacting with the iPad is not ideal for the patient you are evaluating. Q: When would you use Assisted Mode? A: As I mentioned, I would switch to Assisted Mode if the REACT wizard paused an automated test due to a subject’s response behavior. Perhaps they didn’t understand the instructions. The system will recognize that they need help. Or, when testing children. I’ve noticed that a lot of young patients are initially excited to interact with the iPad. But they can have shorter attention spans than our adult patients. If they start to lose interest, you may wish to take control and switch to Assisted Mode. Also, if the patient has any dexterity issues, they may find it hard to complete the test. This is a great time for Assisted Mode. Q: Would you ever start a test in Assisted Mode – and why use it instead of “administering” an automated test? A: I most definitely would start a test in Assisted Mode under a few conditions. One, if the patient is pressed for time. I’m seeing Assisted Mode testing taking as much as 40% less time. If they do have the time though, I like to let the test patient administer their own automated test as I’ve seen this reduce some testing anxiety. People like to be active participants in their hearing health. But again, if they need to get out of there quickly, I suggest starting in Assisted Mode. Q: How would you instruct someone to administer an Assisted Mode test for the first time? A: First, the administrator should explain the test process before anything else. Especially before placing the headphones over the test subject’s ears. Tell them that they will be sitting facing away from you. This helps to ensure that the tester doesn’t give any visual indicators to the patient of presenting a tone. Then, ask them to provide a cue to indicate when they hear a tone, even a very soft one. This could be raising a hand, a finger, or even nodding their head. Finally, let the patient know that you will tap them on the shoulder when you’re ready to start the tone presentation, and again once the test is done. At this point, the tester can help position the patient in their chair, and place the headphones on. Q: Final question. What is the experience like for the test subject in Assisted Mode versus Automated Mode? A: I’d like to say that both deliver a unique and helpful testing experience. Many patients will prefer to “play” the automated game and thus take a more active role in the evaluation process. For those who are less familiar with an iPad, or who may have some additional challenges, Assisted Mode may be better suited as someone else is in the driver’s seat. For me, what I love about SHOEBOX, is that it gives you these testing choices. You can decide what makes the most sense for you, your patient, and your environment. 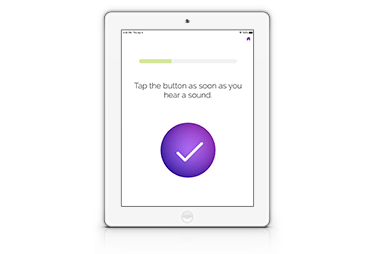 Assisted Mode is one more capability within the product that enables more clinically valid hearing testing, by more people, in more locations. 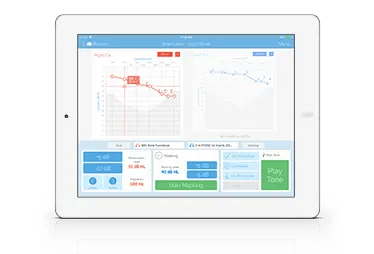 For more information on Assisted Mode testing with SHOEBOX Audiometry, watch this short instructional video.